— that’s what the oldest and the youngest serpents will tell you. There once lived a group of French economists who believed that nature was the ultimate source of all our wealth, and were thus called Physiocrats (from the Greek physis, meaning nature). Their idea did not catch on, however, and succeeding economists have usually regarded nature’s gifts as limitless, and thus essentially free. According to this latter view (which has become economic orthodoxy) the price of a natural resource should only be that of the labour needed to extract it. Such ideas have helped underwrite our current practice of natural resource consumption, which might otherwise appear as a form of planetary asset stripping. This thinking is beginning to change with the development of ecology and earth-systems science and the dawning realization that nature’s bounty is not limitless. Some attempts are even being made to ascribe money-values to nature’s services. Needless to say, the potential bill is rather large. So the Physiocratic idea may return, if only to haunt us. For a painter like me, it has a certain resonance. — even inevitable — and nature as obliging, but it was not always so. In the old Biblical tale of the Garden of Eden, the story of progress is inverted. There, nature began supremely bountiful, but was ruined by our inability to live within limits. Because of human fecklessness, nature was degraded and impoverished: suffering and death became a grim necessity, the consequence of squandered wealth. This is only a folk-tale of course, but I suspect that by the time our civilisation has run its course it may have gained a new layer of meaning. To explain nature's harshness and cruelty, the Edenic tale proposed an event — an original sin committed by an ancient ancestor — which broke the harmony of nature. Through the attainment of knowledge, we became conscious of our selfhood, our separateness, and were cast out of the unconscious communion of living things. 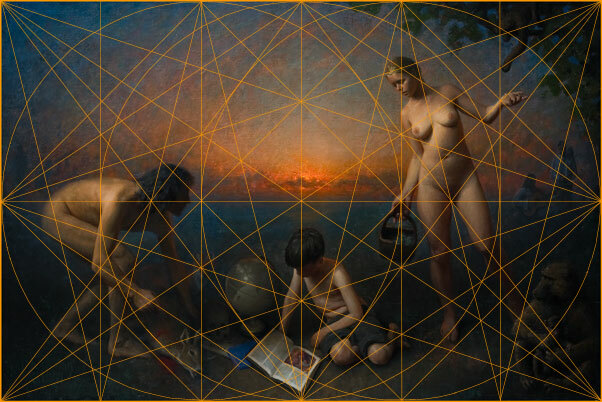 Through labour and art we created a new world for ourselves - a second nature - but hardly a substitute for paradise lost. When we try to give meaning to suffering and evil today, we may not be able to explain things so simplistically. Evolution is the creation myth of our age, but its implications are more ambiguous. Biological records yield no sign of an age of innocence, no moment of corruption, no first ancestor to blame. Nature was beastly from the beginning. Suffering and evil were woven into the fabric of life long before humans could influence matters. We inherited our beastliness. 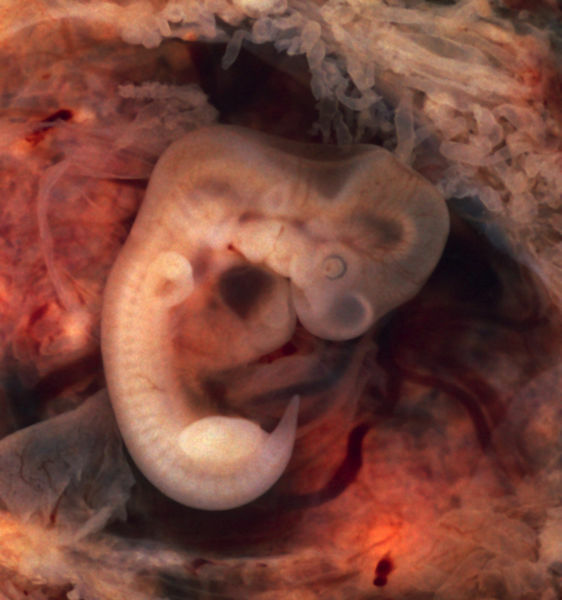 The image of a four-week-old human embryo, repeating in its growth the path of evolutionary history, already displays that mark of the devil — a tail. The harmony of this world is a combination of contraries, like the chords of a lyre or the string of a bow, which bend and unbend. Never, as the poet Euripides said, is good separated from evil: there must be a mixture of the one and the other. My painting was conceived in this spirit. 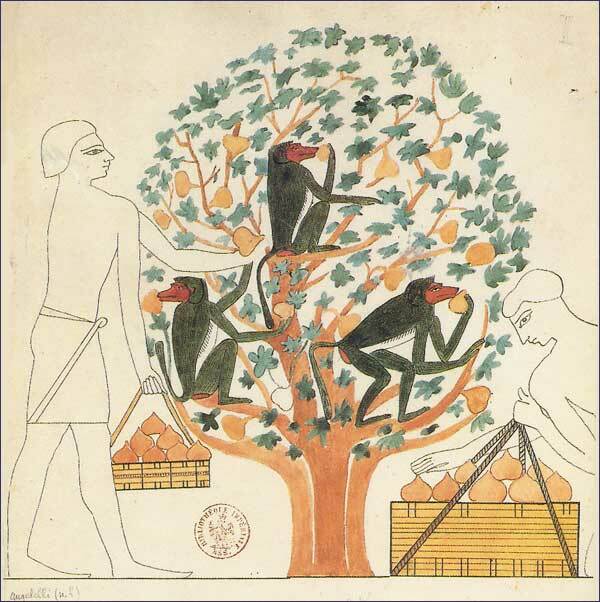 It was inspired, in the first place, by an ancient Egyptian image showing a fig tree being harvested by two workers, while three baboons, still in the tree, continued to enjoy its fruits. I was impressed by this calm, civilised image of sharing and peaceful coexistence with the natural world. Thinking how, in Mediterranean tradition, the fruit of knowledge is often depicted as a fig, and also how, in old Egyptian traditions, the baboon represented Thoth, a god of wisdom, master of all ‘the sacred books in the house of life’, I was led to re-imagine the biblical myth in terms of this sweeter image. I do not think of the tree in my painting as specifically imparting knowledge of good and evil: such knowledge, bound up with action and the will, is not, perhaps, well-represented by the image of a tree. For me, the fruit of the tree symbolises a type of knowledge that is not willed or chosen, but accepted — a gift of nature, a kind of intuitive wisdom. As the agent of its wisdom, one could say that my Venus/Eve figure is an embodiment of the sensus communis, of Mother Wit, whose lack ‘no school can make good’. Her open pose reflects what Heidegger called Gelassenheit, or releasement; a state of receptivity devoid of willing. But human life requires more than Gelassenheit: the boy will need a broader schooling. He may need to learn all the dark arts of survival. So the hunter too has his lessons to impart. The painter and musician in the background are representatives of the imaginative arts, since these, too, belong in my paradise. It is the dream of every artist to produce a work as spontaneously and ‘innocently’ as the fruit tree produces its fruit. None succeed, but you can’t always tell that from the result. At their best, the arts embody an intuitive wisdom, helping bring order and harmony to our relations with each other, and with nature. At its best, art, which is man’s ‘second nature’, gives us a vision of what it might be to live a life of simplicity and innocence. Like Yeats, Giambattista Vico, the great eighteenth-century Italian philosopher, did not believe in our natural innocence. He imagined original man living a life, not of innocence, but of shame and terror. Awed by the powerful natural forces he was subject to, and conscious of his own weakness, he lived in constant fear that, by his actions, he was offending higher powers. To placate these he made sacrifices, promised to live a better life, and wrapped all his actions in ceremonial forms intended to show respect for, and win the favour of, the gods. Each major life event became a sacrament, the celebration of a covenant between man and god. Respecting social order and authority, our ancestors saw themselves as respecting the gods from which that authority was derived. From these sacraments evolved religion, the law, and all the institutions of human society. With their development, man gained a more secure existence, and with his terrors assuaged he could begin to think clearly and set about satisfying his material needs. Gradually, he invented clever arts that tilted the natural balance in his favour, and as his material prosperity increased, he gained confidence in his own powers of action and reasoning. Eventually nature appears conquered, and he comes to believe that there is no power greater than himself: he is master of his own fate and no longer needs to placate the gods. As terror yields to confidence the feeling for the sacred declines. Ultimately, sacraments are felt to be unnecessary, and ceremony loses its meaning. The bonds and institutions which originally bound society together, and made human life meaningful and dignified, begin to weaken. We are left free to gratify our material desires, but society is slowly being atomised. Thus no matter how great the throng and press of their bodies, they live like wild beasts in a deep solitude of spirit and will, scarcely any two being able to agree since each follows his own pleasure or caprice. Such a society, Vico promises, will eventually collapse into a second barbarism, a barbarism not of ignorance but of calculation. Life will once again become nasty, brutish and short, but through this, in time, our terror before nature and the feeling for the sacred will be renewed. Vico’s story resonates within me: I am one in whom the feeling for ceremony, and sense of the sacred have largely been destroyed. I also know something of his ‘deep solitude of the spirit and will’, and see it around me. I believe that the arts, in their prime, are an expression of our sense of the sacred; a response to our awe and terror before nature. It is a sense that is constantly undermined by the advance of modern society, and that we must struggle to recover. So shall I at last be whole. Setting the human figure in his imagined world, Gauguin sought to rediscover what it might be to live in harmony with nature, and at peace with ourselves. He did not find paradise in the South Seas, but within him, where it can always be found. We still need to find our paradise, and paint it.